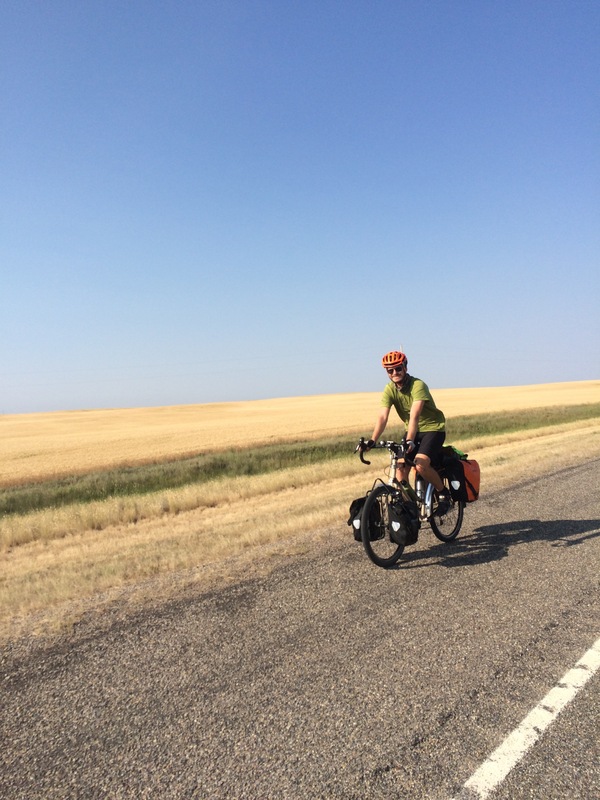 Day 25, Shelby, MT to Havre, MT: 107.8 miles, 2,385 ft. elevation gain, 14 mph average speed. We woke up from a deep sleep (beds!) at 5:30a, but couldn’t manage to get as early of a start as we aimed for, leaving around 6:30a. We were greeted by a small hill out of town, but then flats / downhills / small rollers for the next 40 miles into Chester. We beat our previous cycling without stopping record by 10 miles, cycling for 27 miles nonstop. We made it to Chester, 42 miles in and 2/5 of our total ride by 9:45a and decided to treat ourselves to breakfast at Spud’s cafe. 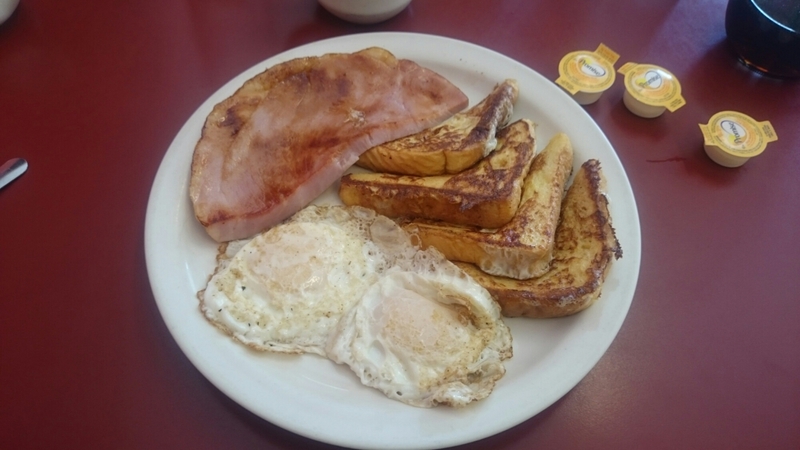 I got a delicious, sloppy skillet meal and Ted got the Hungryman breakfast, which included, among other things, a giant ham steak. Our waitress was a nine- or ten-year-old girl sucking a lollipop. Sort of disconcerting, but I guess child labor is common at family-owned restaurants in tiny towns in Northern Montana? She probably considers it a fun summer activity. We met two other bike tourists at the restaurant, two retired guys from Des Moines who were cycling the northern tier to Iowa. Interestingly, more than half of the other cycle tourists we’ve met on this trip are in their 50s and 60s and retired. When else do you have the time to do something like this? They also tend to have higher budgets than the rest of us and stay in motels most, or at least many, nights. After breakfast we pushed on, determined to break our remaining 61 miles into manageable 20-mile increments. 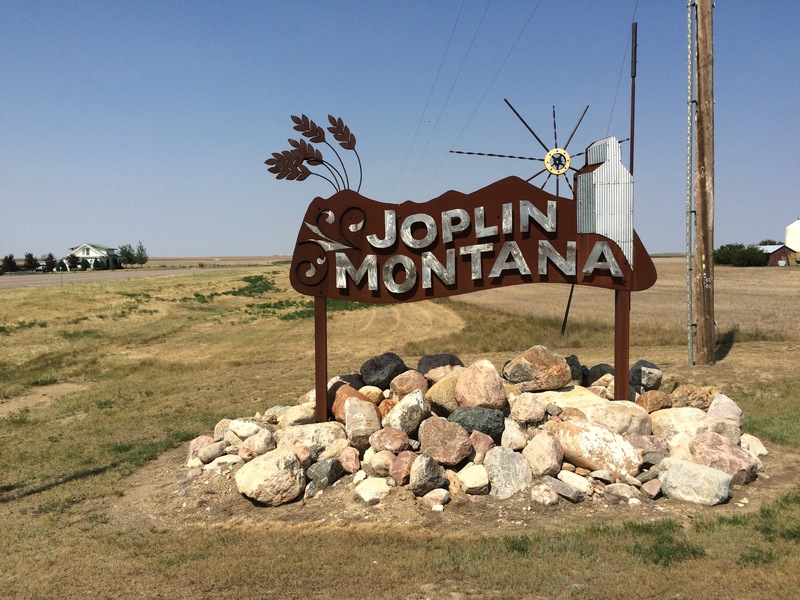 We passed through many grain fields (I had “America the Beautiful” stuck in my head all morning and couldn’t figure out why they weren’t golden waves of grain rather than amber until I finally saw an amber field of grain) and many cute towns with funky signs. 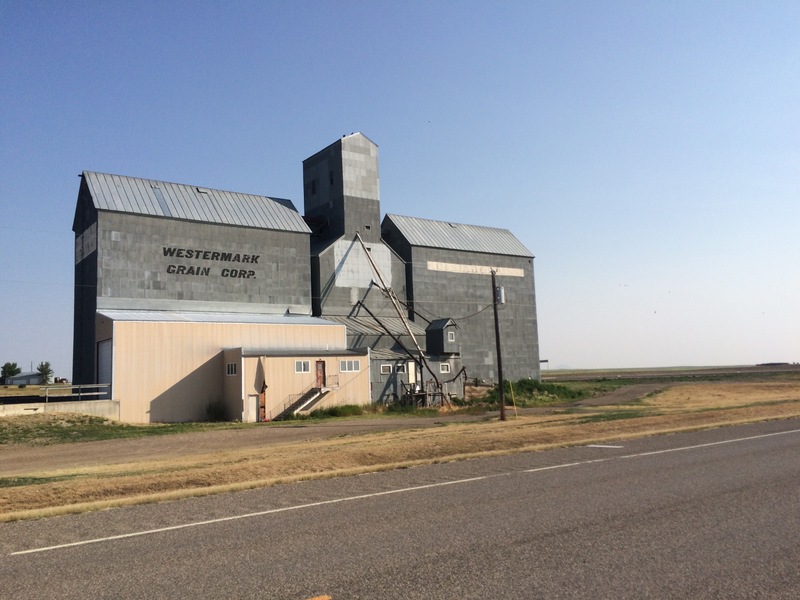 We learned today that town=grain elevator. A town might also have a restaurant, car service shop, or convenience store, but not much else and not usually. Towns with grocery stores seem to be about 40-50 miles apart. We stopped in Rudyard about 20 miles after Chester because the town seemed to have a funny obsession with dinosaurs and it definitely had a Amish deli, where we hoped to get cold drinks. 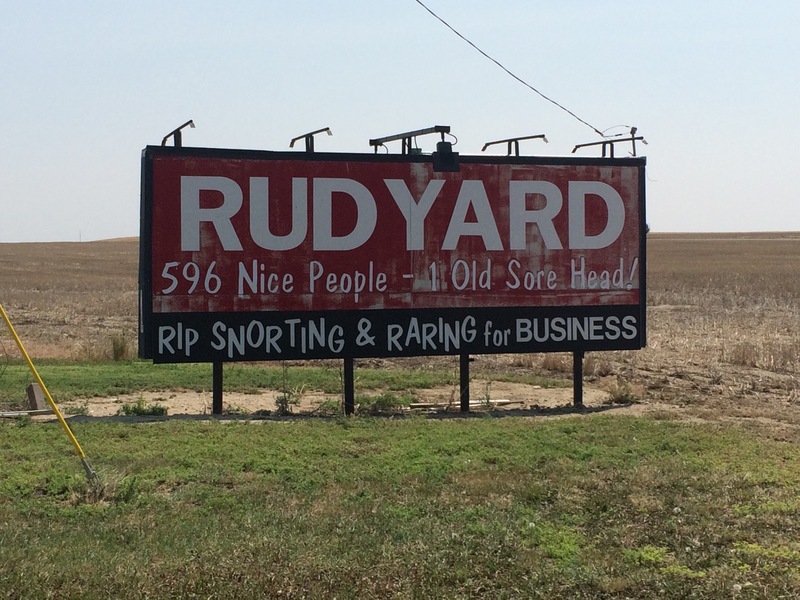 They also had a funny sign that made us think there would be interesting people in the town. Most of the shops on main street were boarded up except for the Amish Deli (which was not only not boarded up, but had a neon sign to ensure folks don’t miss it), a movie theater (playing a mystery movie on Thursday and that was it), and a pristine Wells Fargo bank. Interesting to see the businesses that stick around after the town falls apart. We walked into the Amish deli and found the lunch rush of farmers. Got some weird looks in there, but proceeded to the ice cream counter. A small boy, possibly 12 years old, peaked over the counter and told us to sit wherever we liked. We ordered milkshakes and they took over 20 minutes to come out because the 12 year old was slow and deliberate in his operation of the ancient milkshake machine. Among other problems with child labor, I’ve found that nine to 12-year-olds are sort of brusque, forgetful, and inefficient. But you can’t fault them for it because they’re children and they haven’t yet learned about Americans’ expectation for fast, error-free, pandering customer service. After delayed milkshakes, we had to make up time to get to the post office before it closed at 5p. 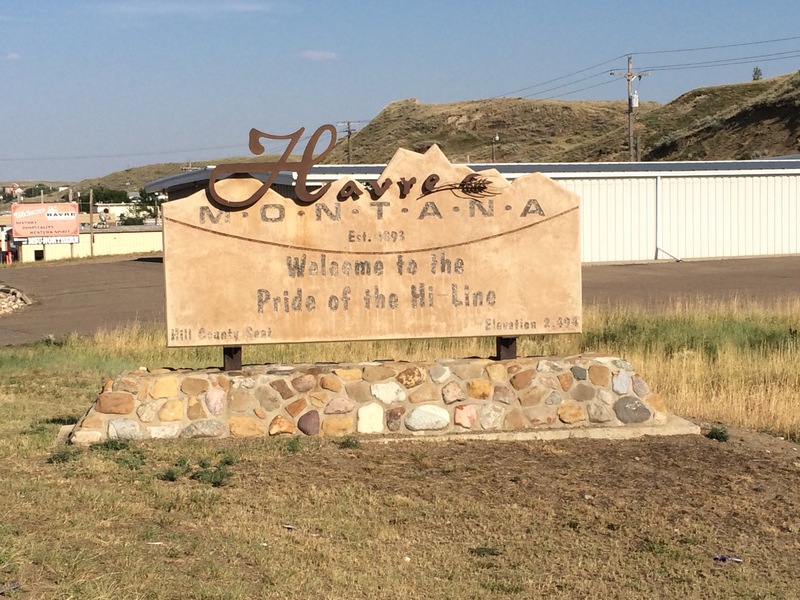 We rushed to Havre without stopping much or for long and got to the post office only to find out that the package that we paid extra to ship express had not arrived. We called REI and they refunded our shipping, but we will have to get a late start tomorrow since we have to go to the post office. We headed to our warm showers host’s house. Lindsay is 26, works in admissions at Montana State University – northern, and is pursuing her MPA at University of Montana. She fed us curry chicken sandwiches and ants on a log! Yay! Lindsay has sort of set her living room up as a hostel and loves hosting travelers and hosts people frequently, which is so nice of her. 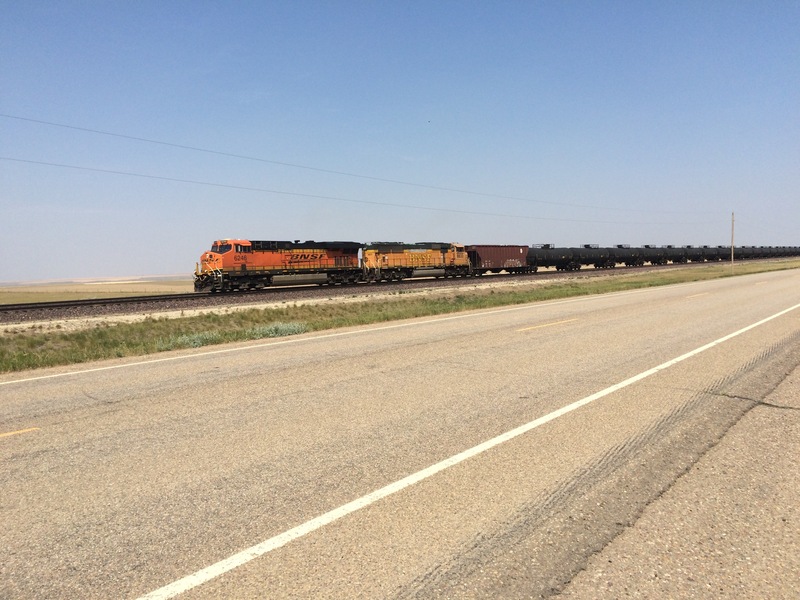 We hung out with her, her friend John Paul (who is also a warm showers and couch surfing host), and his couchsurfing.com guest, a man from Pakistan who is riding the Empire Builder train across America and wanted to spend a few days in each state he passed through and somehow chose Havre of all places. 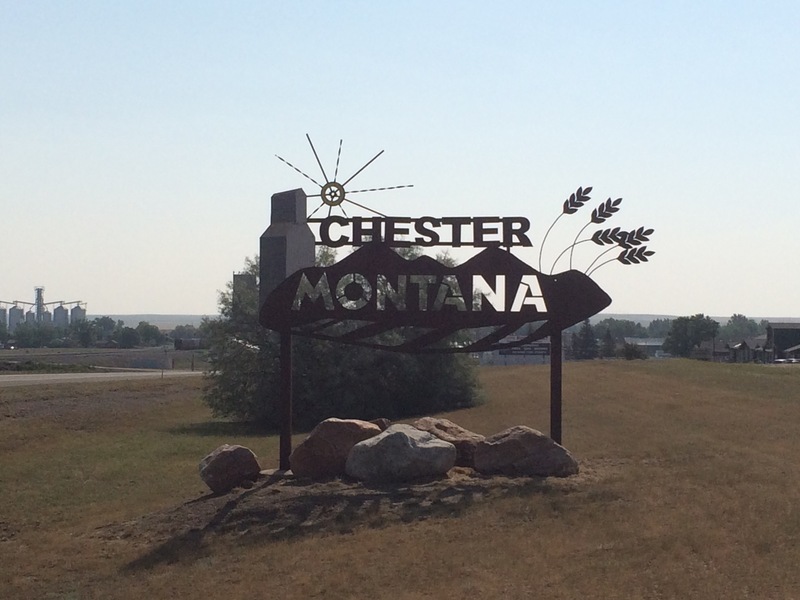 I suppose it is the biggest town we’ve ridden through in Montana that’s on the train line, but what an odd part of America to see. Cowboys and a few young people who ended up in Havre at the beginning of their careers or to go to school. His next stop is Sandpoint, ID, though, so I think he’ll find that a bit more interesting. Lindsay attended the University of Miami and when I attempted to bond with her over us both attending Florida schools, she made sure to tell me that Miami was “statistically” a better school. I don’t know what statistics she’s citing, but if she’s referring to US News rankings, UF and UM are tied at 48th so they are “statistically” equal and neither school is great anyway. But the more important point is that US News rankings are not statistics. Anyway, that’s my petty rant for the day. We had a nice conversation about life in Montana, during which we learned that Lindsay and John Paul are both paying less for a one-bedroom apartment than I paid for my share of a four-bedroom apartment in college, which is less than a quarter of what we pay for a much smaller one-bedroom apartment in NYC. So that was enlightening. Get to sleep in tomorrow a bit since we can’t start until 8:30! Edit: I forgot to mention why today was the day of the rumble strip! We rode for about 15 miles with a one-foot shoulder that was entirely rumble stripped, then for 25 miles on a shoulder that had a deep rumble strip at the white line, but the whole rest of the 3-foot shoulder was a less visible, but still very painful rumble strip. The problem with the latter is that cars aren’t as forgiving about bikes on the road when there appears to be a perfectly good shoulder, so we had to ride on that stupid rumble strip every time a car passed, which was often.